One of my favorite fantasy reads of 2012 was Seraphina by Rachel Hartman. The writing was beautiful (I dare you to read the first page and stop reading), and I love, love, love Hartman's unique dragons in the story. When I saw the cover, I was initially hesitant, but I grew to love it. "I'll admit, I wasn't so sure when I saw this cover that this would be a book I'd like. I've gotten to used the flashy covers with models and weapons and action. But, I have come to adore this cover; I think it captures the essence of the setting and is just as artistic and sophisticated as the book behind it. I love it." 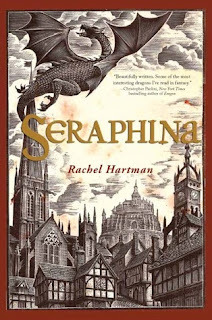 So, time passed, Seraphina won the William C. Morris Award (yay! ), and then I noticed that a new cover had started appearing online, even though my bookstore stocked copies with the original cover. I think that covers make it seem a little more exciting and eye-catching, and I like that the "s" is sort of dragon-like as well! I really love that they kept the artwork from the original cover because it is just so beautiful (but I am also really glad that my copy has the original cover). 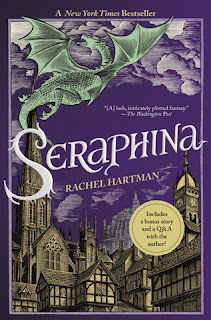 And the sequel has been announced--it'll be called Dracomachia, which doesn't sound very good for any of the dragons I've come to love. Goodreads says we'll have to wait until February 2014. You're killing me, Rachel Hartman. I was actually a fan of the original cover (especially since the author signed it), but I like the new one. Very eye catching as you mentioned. And I'm happy that she won that award. Oh, me too! 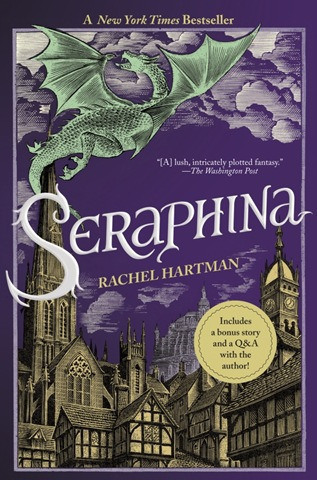 I was really pleased with the shortlist, and I knew that I'd like any book that won, but Seraphina was my favorite! Whenever I sell it to a customer at the bookstore, I just want to do a little happy dance. I can't decide what I think of this cover. I've seen it around too and I can't decide if I like it or not. I like how the 'S' pops and looks like a dragon but the color just seems odd somehow. I love the artwork so I'm glad both covers kept the same illustrations. I'm partial to the original as it's the cover I had on my arc but I think the purple one is nice and adds a more "modern" touch that will make it stand out on shelves. I'm really not sure how I feel about the purple. I didn't find the first cover that eye-catching but the purple isn't working that well for me either. I'd like to see it in person before making a decision. I think I like the purple cover better, it's totally superficial, I know but it just caught my attention a bit more. Great post! I love the new cover. The old cover is great but I like the differences that they changed. I agree, Bookworm 1858, it's hard to look at on a computer screen. I can't wait to get more copies of it in at the bookstore so I can see it in person. I do think that the purple makes it look flashier...not always sure that it's necessarily a good thing. I really hope that they keep in the same design scheme/artwork for the sequel! I wonder if the new cover is meant to give it more middle-grade appeal, or appeal to people who weren't drawn in by the academic feel of the original (I, personally, like the academic feel!) Even though it was published as YA, it's more the length and density that gives it that designation, and maybe now that the book's been well-received with young adults and adult adults, the publishers are trying to expand its reach. Just a thought. I love the way you did this review! I thought that this was just such a fun and magnetic book, and I was so captured by it. I am really glad that you loved it too, and that it was all that you hoped it would be!